What a winter we’ve had, with few chinooks and much more snow than we’re used to in Calgary. If you’ve lived here very long, you know we could still see plenty of wet, wintry weather in April and May; you’ll want to keep that spring precipitation and melting out of your basement. We’re getting numerous calls about purported plumbing leaks that actually turn out to be roofing damage. 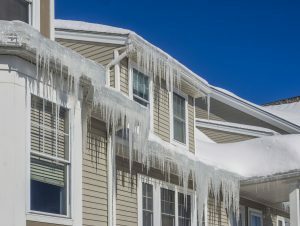 The homeowner will notice water dripping from a pipe bend and assume there’s a leak, when in fact the freeze/thaw cycle has caused ice dams to block proper drainage of the roof. This can result in a pooling situation where ice will press against and damage the venting fixtures that go through the roof of the home, causing leaks. Do what you can to make sure your eavestroughs are clean and clear so that melt from the roof and rainwater can flow freely. This year, that can be a pretty tall order– lots of downspouts are still frozen, especially those that don’t see direct sunlight. Check to be sure your downspouts are connected and unobstructed, and are directing the water to a slope away from the house, or to a storm drain (if available). Take care not to direct the flow toward a driveway or sidewalk where it can create a hazard during nighttime re-freezing. With the amount of snow we’ve received this winter, it’s all the more important to clear the area around the foundation of your home. Mercifully, the melt has been a slow one so far. Have a look around your property for any accumulations of snow against the house and shovel these off to an area that slopes away from the foundation. Chances are, your property has a back grade at some point; identify these areas and ensure they are clear of snow. An hour’s preventative work can save you the headache caused by that water rolling right back into the house. When melting does occur, take note of low spots around your home where water accumulates and fill them as soon as you can. If you have window wells around your home’s foundation, now is the time to remove any drain caps that might be in place before the melt or heavy rainfall floods them. Another thing to watch out for this spring is the possibility of rainfall when there’s still snow on the ground. Under those conditions, much of the ground is still frozen and can’t absorb the rainfall, making flash flooding a bit more likely. This underscores the need to keep your property draining well. Your sump pump should be checked yearly to ensure it will be in proper working order when it really counts. First, be sure the outlet pipe is free and clear of obstructions. Next, remove the pit cover and examine the pump itself, making sure that the recess is free of any debris that could hamper its operation, and that the float is free to move. Very important: be sure the pump is plugged into a Ground Fault Circuit Interruptor (GFCI); this protects anyone from possible electrocution in the case of a short circuit while the pump is submerged. Finally, to test the pump, slowly pour a bucket of water into the pump’s recess, keeping an eye on the float switch. When the water level lifts the float, the pump should cycle on and pump the water out. Ensure the pump turns itself off once the water is cleared. Repeat this process once or twice to be sure the system is operating smoothly. The first time you turn the supply to your outdoor taps back on, check for leaks right away, especially if you were late turning them off in the fall. If freezing damage has occurred, it might not be readily apparent to you until the water is back on. The best practice is to get someone to keep an eye on the inside pipe and watch for leaks when you run the hose outside for the first time. If there’s a problem, catch it before there’s an inch of water in the basement! We provide inspection, repairs, maintenance and installation of sump pumps, and we can ensure your outdoor water lines are trouble free. If there’s any unwanted water in your house, we can do something about it. We’re here to help.